Comparing the start of 2016 and of 2017 there is a notable difference. Last year has started rather quietly on the birding front with a few songbirds on the plateau of the "Fränkische Schweiz" (including an overwintering Great Grey Shrike). This year was - as already mentioned - absolutely different. 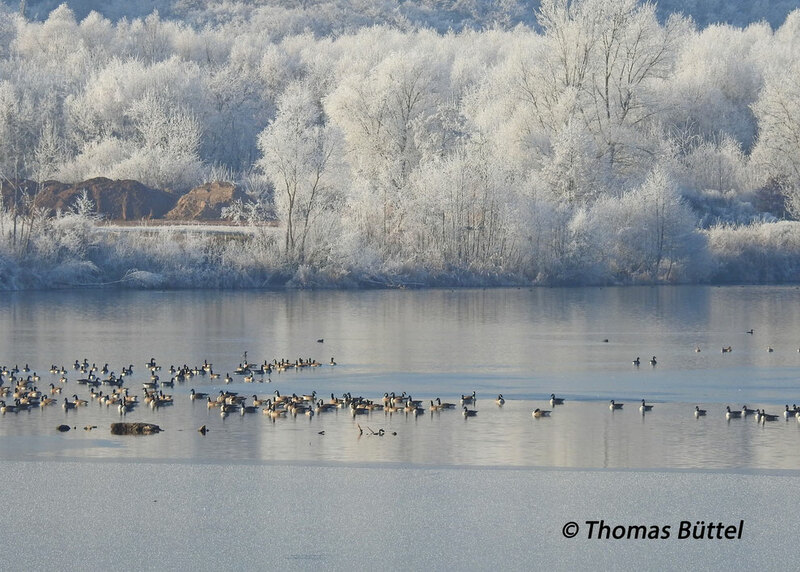 It has got very cold over the last days and so most of the quarry ponds around Bamberg are currently frozen offering the dozens of water birds no shelter anymore. 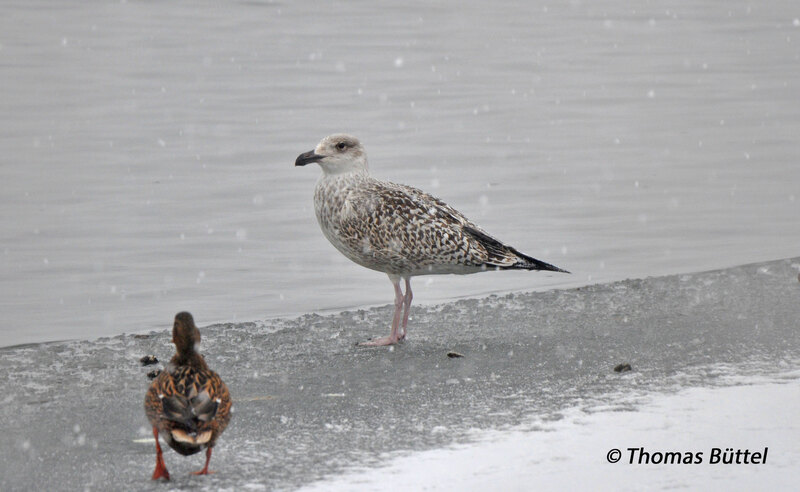 Therefore I hoped that the waterfowl would concentrate on the three largest lakes that aren't freezing over so fast: The Baggersee Roßstadt Süd, the Oberhaider Baggersee and the Porznersee. The birding strategy for the first days in the new year was hence simple. The first site I visited was the Baggersee Roßstadt Süd, which was indeed ice-free and therefore covered with hundreds of water birds. 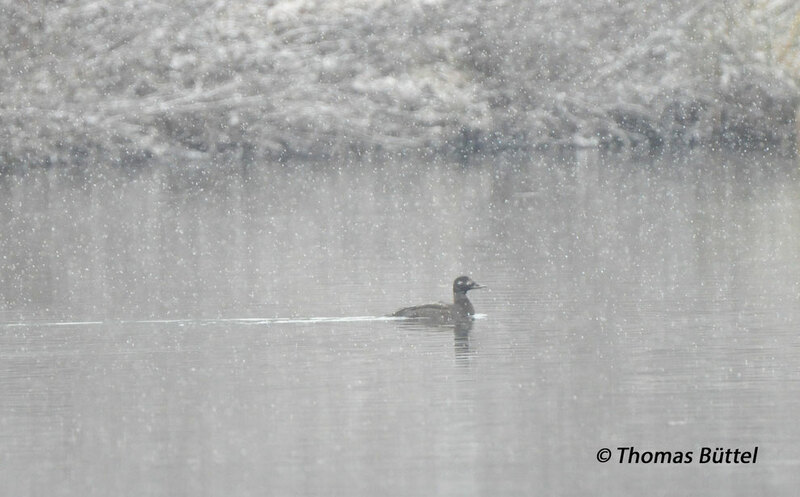 There were several hundred Canada Geese, lots of Goosanders, Goldeneyes, an immature Caspian Gull and even 12 Smews. Truly not a bad start with a couple of quality species. Unfortunately the next stop, the Oberhaider Baggersee, was slightly disappointing as there was just a small hole in the ice and therefore neither many nor particularly good birds. Finally there was just one quarry pond left, the Porznersee 10 km north of Bamberg. As I arrived almost 60 % of the lake was frozen over leaving just a rather small ice-free area packed full with waterbirds. Nevertheless, the most interesting bird here wasn't among the masses of Coots and Tufted Ducks but on the very shore where I was standing, an immature gull. It looked rather strange for one of the usual Yellow-legged Gulls and already in the field I thought of a Great Black backed Gull. I took a set of photos in the hope of identifying it later on. 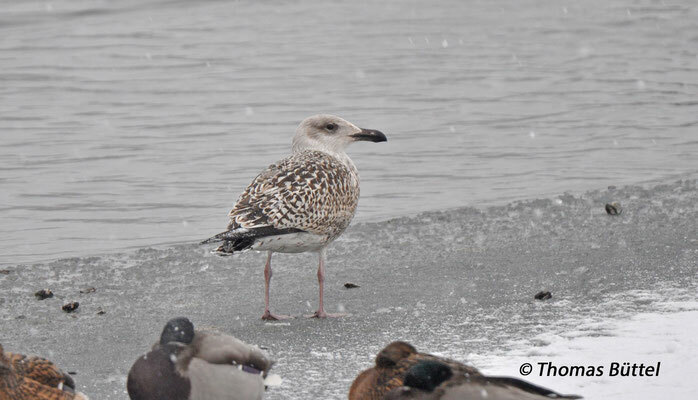 Back home my assumptions were confirmed, it was indeed a 1st winter Great Black backed Gull. This is a very good species for Bavaria and as far as I know the first record for the district of Bamberg. A very cool way to start a year. The end of my tour marked a visit of the harbour of Bamberg, a great place for observing gulls in the winter, as mentioned earlier in other posts. However, even though it had been very cold, the gull roost hasn't significantly grown and was still very far away. A closer examination of the largest gathering produced mainly Black-headed Gulls, few Common Gulls and surprisingly virtually no large gulls. 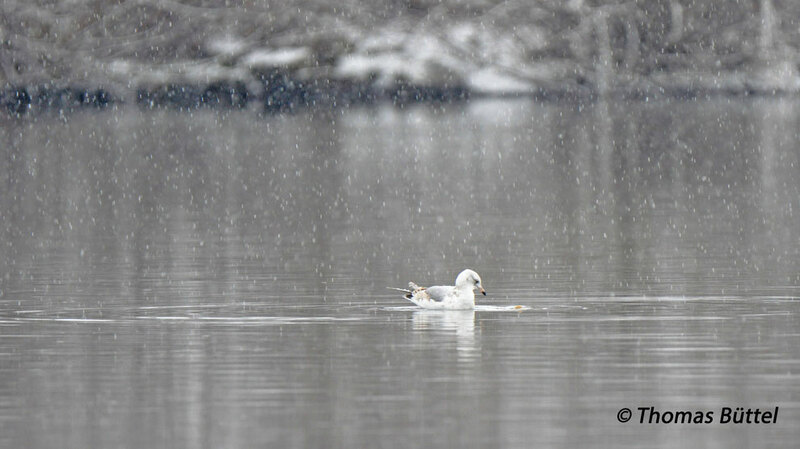 However, considering the Great Black backed Gull at the Porznersee, I can still be happy with what I got. Just as I was about to break up and go home, I spotted a medium sized duck landing on the canal. A quick look through the scope and I could hardly believe my eyes, but there was definitely a Velvet Scoter swimming in front of me, another great species and my first self-found individual. After I had taken some record shots, I finally returned to the car finishing a superb first birding day in the new year.